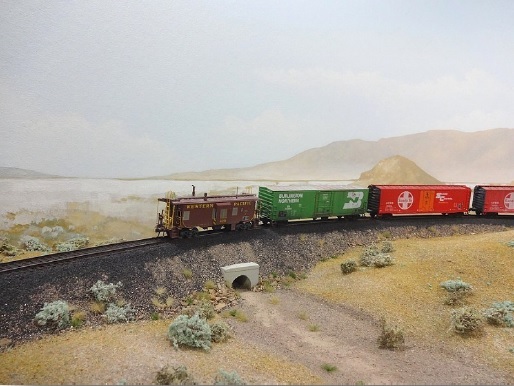 Rob’s HO Western Pacific’s 8th Subdivision is a proto-freelanced extension of the WP set in Utah in the 1978-1982 era. The layout is approximately 30 x 30 ft. The layout has been under construction for just over six years and is nearly 100% complete. Scenery is outstanding with a custom painted backdrop. There are many large scratch built and kitbashed buildings to see. The layout has two levels with a lower deck staging yard and a branch line. Construction details include the use of structural backdrops to reinforce the 60-foot long serpentine peninsula. Rob uses codes 83, 70 and 55 flex track installed with caulk. Control is NCE DCC. For a video of operations on Rob’s Western Pacific 8th Sub click here. For Rob’s Blog on Model Railroad Hobbyist with lots of comments, photos and some videos, click here. For more detailed information on Rob’s Western Pacific 8th Sub click here.